Conceived and developed by the U.S. Women’s National Team players, SheBelieves is a movement to inspire girls and young women and encourage them to accomplish their goals and dreams, athletic or otherwise. The campaign was originally launched in the run-up to the 2015 Women’s World Cup but has since evolved and grown into a special bond between the team and its fans, taking its powerful message of empowerment and that of believing in yourself into communities across the nation. As one of the most popular women’s teams in the United States, the WNT is the prime example that dreams are attainable if you set your mind to it and go after what you want. Through dedication, teamwork, perseverance and success, the players in the U.S. team inspire new generations of young girls and women to be better and strive for better. They inspire them to believe. In a culture where young girls are often influenced by outdated gender norms, it is the mission of the U.S. WNT players and U.S. Soccer to empower girls to reach their dreams. You and your organization can join this mission by spreading messages of positivity and showcasing your athletes and their stories as examples of hope and success. The empowerment of young women and girls is not an overnight objective but a permanent movement that can impact millions, because when girls and women succeed, we all succeed. 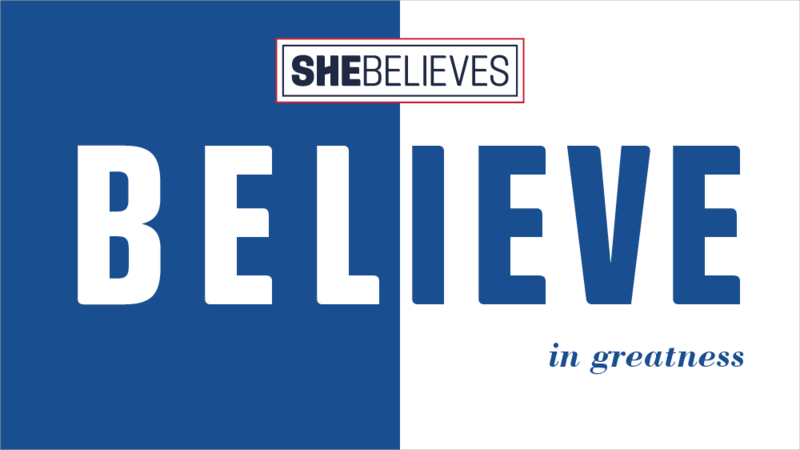 Join us by using #SheBelieves or #SheBelievesCup to broaden the awareness of this campaign that impacts every young girl and woman with a dream around the globe. Thank you for cheering on your U.S. Women’s National Team at the 2019 SheBelieves Cup! We cannot wait until the 2020 SheBelieves Cup! Looking to exemplify the SheBelieves ethos in your work life? Apply for one of our SheBelieves Internships to make that a reality. A SheBelieves Hero is a leader in their community, a confident and passionate individual who empowers others around her and is working to make a difference. Relive the 2019 SheBelieves Summit, presented by Deloitte that brought together women in leadership from across the nation.